The school is located just east of Toronto’s downtown core, in Corktown. The boundaries for Corktown are roughly Berkeley Street to the west; Shuter Street to the north; the Don River, to the east; Lakeshore Boulevard to the south. Corktown developed in the early 19th century, getting its name from its many County Cork immigrants. Presumably some of the students lived in worker cottages on Trinity and Sackville Streets built by the Gooderhams. 1887: Designed in plain Victorian style by Toronto architect William George Storm. Sackville Street school was the third school in the area, replacing the Enoch Turner School (1848–1859; now a museum) and the nearby Palace Street School (1859). Storm designed many Toronto buildings and schools. In 1874, he designed five (mostly brick) public schools, each for a different city ward, including Wellesley Street School (St. John’s Ward School) and an enlargement to Borden Street School (St. Patrick’s Ward School). 1888: Eight-roomed school opened with an initial enrolment of 49 pupils: increased to 260. One or more additional classes were held in temporary classes. Average attendance in 1900 was 369 students. Head Mistress: Mrs. Georgina Stanley Riches, formerly principal of Palace Street School. She served until 1912, when she ended a 37-year teaching career. 1974: Sackville Street School classes closed. The school building then became Inglenook Community High School and temporarily an aboriginal school called Wandering Spirit Survival School. 1975 Apr 17: Board decided to locate the “French Elementary School” (later named École Publique Gabrielle-Roy) in the Sackville Public School building. 1985: Archaeologists digging on the school grounds uncovered clues to Toronto’s history as a terminus of the Underground Railroad. Between 1834 and 1890, this site was the home of Thornton and Lucie Blackburn, refugee former slaves from Kentucky who started Toronto’s first taxicab company. In front of the school are two plaques outlining the history of the Blackburns. The site of the dig (front of the school, which faces south) is covered in flat stones designed like a chain, but with a broken link to indicate the end of slavery. The school resource room door has a plaque: Thornton Blackburn Resource Room. NOTE: Sackville Street School is Toronto’s oldest building having continuous use as a school. A date stone under the peak on the west side reads: Public School / A.D. 1887. The school retains many original architectural characteristics, including: 20-foot ceilings; huge windows which allow ample natural light and air; wooden wainscoting; cloakrooms with sculpted wooden arches; marble washrooms in the basement; boys’ and girls’ entrances, clearly marked in stone relief. SAC-PS-a (WW I): Wooden frame. Hand-drawn Union Jack—faded but colour still apparent—between two silhouettes of soldiers with their hands behind their backs. 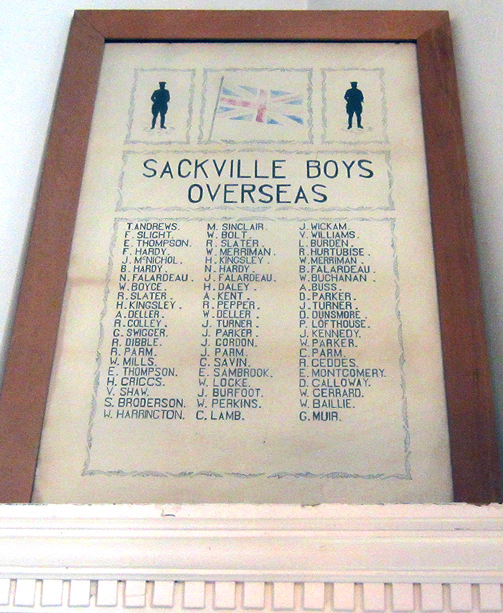 (In uppercase letters): Sackville Boys / Overseas. Three columns. Single initials followed by surnames in random order; printed in uppercase letters. No Key. List does not specify which war, and because only first initials appear, checking against World War I attestation papers is so far inconclusive. The design and physical condition of the memorial indicate World War I. NOTE: The letters C and G look much alike in the script used. In 1883, a two-room brick school was built on what was then known as Mabel Street in the village of Brockton. The school became part of the Toronto school system with the annexation of the village on March 25, 1884. In April 1884, Mabel Street School was listed for the first time in the Toronto Board’s records as having an enrolment of 128 pupils. The 1890 Annual Report of the Toronto Board’s Superintendent of Buildings describes Mabel Street School at the corner of Shirley Street and St. Clarens Avenue. 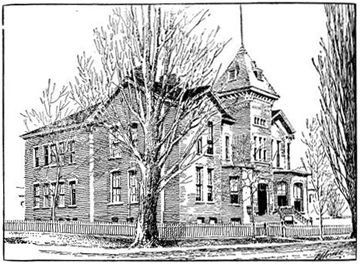 In 1892, the Board decided to build a four-room school to replace the Mabel Street School. As the name of the street had been changed, the new school was named Shirley Street School. This building was opened in 1893, with an enrolment of 127 students. Both the 1892 and 1893 Board Hand Books list Mrs. E. Lilly and Miss A.R. McCrea, teachers. Additions were erected in 1894 and 1914. The building was demolished in the fall of 1962. Buildings for the present (2008) building began November 1961. The cornerstone was laid May 18, 1962. The school was occupied by pupils on September 4, 1962. SHR-PS-a (WW I): framed “Roll of Honor”; below furled Union Jack and Red Ensign, are the words “Greater love hath no man than this.” Crown superimposed on maple leaf, with “Canada” printed below. Printed names—surnames followed by forenames. A stick-on star is footnoted “killed in action.” Printer: copyright R. Douglas Fraser, Toronto, 1916. Notation in ink at bottom of the list reads A. or R. Major Sept. 15/17 (probably the calligrapher). SHR-PS-b (WW II): A.J. Casson; red cross “killed in action”; surnames followed by forenames. Location: 55 Ypres Road, Toronto (York) Ontario M6M 1P1 (south of Eglinton Avenue West; off the east side of Keele Street) This is a “vanished” school. No physical traces of the building—demolished in 2013—remain. Note: Silverthorn Collegiate Institute (opened 1964) at 291 Mill Road, in the Markland Wood neighbourhood on the western border of Etobicoke, was also named for the original Silverthorn family. The now-demolished Silverthorn School and Silverthorn Collegiate Institute are approximately 8 miles (13 km) apart, and separated by the Humber River. The approximate boundaries of the Silverthorn district are: St. Clair Avenue West on the south; Eglinton Avenue West on the north; Keele Street on the west; CN Railway tracks on the east. Toronto’s typical grid pattern does not work here, as the neighbourhood’s hilly terrain, especially along Rowntree’s Creek (which flows west to join Black Creek) causes many “no exit” and one-way streets. Silverthorn District took its name from the Silverthorn family, Loyalists with roots in Yorkshire, England. The Silverthorns had settled in New Jersey, U.S.A. in 1700, but after the Revolutionary War, moved to Lundy’s Lane, in the Niagara District of Ontario. In 1807, deciding that they were still too close to the States, they moved to Etobicoke, where they acquired several hundred acres of farm land. A Silverthorn descendant moved from Etobicoke Township to York Township and the neighbourhood was named after him. Silverthorn was the third school in Mount Dennis School Section No. 28. The school was built to serve students living east of Dennis Avenue School. 1914: Some housing development on the former farm began under the name Silverthorn Heights. (Ypres Road, the eventual address for the school, was probably so named because the five Great War battles in Ypres, Belgium, took place during 1914-1918. Post World War II immigrants to the community struggled with the pronunciation; most called the street “Eeps.”) Basic city services such as piped water, sewers, mail delivery, garbage collection, and paved roads and sidewalks were not provided until the late 1920s. Electricity arrived in 1916; street lighting came later. 1915 (approximately): The need for a local school became obvious. Until about 1914, a room called “the county room” in Hughes School, owned by the City of Toronto, was set aside for students from the southern section of Silverthorn. Students in the western section attended Dennis Avenue School. A few in the far eastern section went to Fairbank School. Further space was rented as follows: Methodist Church (two classes); McCormack’s Hall (two classes); Legion Hall (one class). Dennis Avenue School also had to rent two rooms in the Maple Leaf Theatre because of overcrowding caused by Silverthorn students. 1916: Building began on a high bank, on the edge of the bush, at the corner of Ewart and Kane Avenues, though there were as yet no finished roads. School would have 10 rooms and a kindergarten. 1917: Formal opening. First principal: W.G. Clipperton. 1920: School Section No. 35, Silverthorn formed from area detached from School Section No. 28 Mount Dennis. 1929: Four rooms and a basement gymnasium added. 1957 Nov 26: A fire that blazed for four hours caused so much damage that the three-storey school reopened as a two-storey building. More than 1,400 students had to relocate until June, as follows: three kindergartens to David Parsons Rowland Youth Centre on Keele Street; one class to York Presbyterian Church; two classes to Hughes School, on Caledonia Avenue; two classes (Miss Amos and Mr. Gould) to Roselands; the balance to C.E. Webster School. Those who went to Roselands were bused every day until the following June. Roselands’ gym was divided into two classrooms to accommodate them. 1969: Some area houses cleared to make room for Kane Senior (later Middle) Public School. 2011: School closed and student population amalgamated with Kane Middle School next door. New name: Silverthorn Community School. 2013: School demolished to make way for Silver Thorn Heights a 43-unit residential area (semi-detached and single family homes). Boylen, J.C. York Township: An historical summary. Municipal Corporation of the Township of York and the Board of Education of the Township of the Township of York, 1954. The chapter entitled “Schools” explains the complicated School Section system of York Township. The school sections were irregular in size; had different tax rates. Kim, Clark. 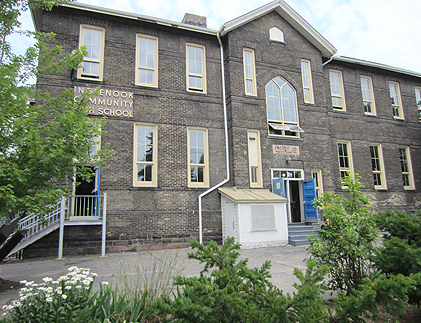 “Preserving Silverthorn Junior Public School’s History,” York Guardian, August 6, 2013. http://www.insidetoronto.com. Has a two-frame gallery of the intact school and the partly-demolished school. Article includes the names and contact info of two former students who are gathering photos and documents to preserve the school’s history. Thomas, Wilbert G. The Legacy of York: (a survey of the early development of the communities of York.) York, Ontario: Historical Committee of the City of York, c1992. 96 p. See: Silverthorn District pp. 66-77. Website: A Facebook group, “So Long to Silverthorn School” has many photos including the stages (70+) of Silverthorn’s demolition. SIL-PS-a: (WWII): Illuminated list designed by A.J. Casson. 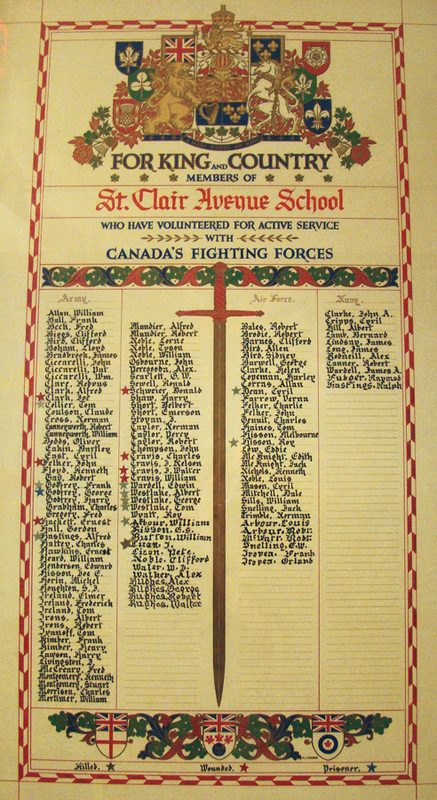 “For King and Country / Members of / Silverthorn School / who have volunteered for active service / with / Canada’s fighting forces.” Six columns. Surnames followed by given names. Key: A red hand-drawn cross indicates “Killed in Action.” This memorial is for the surnames A to L only. It begins with “Air, George C.” and ends with “Lee, James.” List does not specify which war, but date of school opening, presence of women’s names, and the use of an A.J. Casson document, indicate World War II. NOTE: When Silverthorn School was demolished in 2013, the memorial was moved next door to Kane Middle School, which was renamed Silverthorn Community School in order to preserve the older name. NOTE: Memorial SIL-PS-b was missing on the date of our first visit (May 4, 2010). Staff recalled that a previous principal had had it taken down—reasons unknown. Whereabouts of the memorial also unknown; the local Legion had enquired about it. If it turns up, we will add the rest of the Silverthorn names to our database. On our second visit, March 2, 2015, the memorial was still missing. 1970s: School demolished and replaced by townhouses. The memorial is housed at George Syme School, 69 Pritchard Avenue, Toronto, Ontario M6N 1T6. NOTE: More history to follow, when available. STC-PS-a: (WWII) “For King and Country” (illuminated list designed by A.J. Casson). Four columns. Names are listed under branch of service: Army, Navy, Air Force. Surname followed by first names or initials. Silver stick-on star indicates “Killed.” Red stick-on star indicates “Wounded.” Blue stick-on star indicates “Prisoner.” List does not specify which war, but presence of women’s names and the use of an A.J. Casson document indicate World War II. NOTE: The writing is ornate and difficult to read. We could not verify some names even using other sources. Wellesley Public School’s memorial is now preserved in the TDSB archives. Location: northeast corner of Wellesley and Bay streets. Wellesley is a vanished school. No traces of the building remain. NOTE: A photo of the old school and much history can be found on our blog post of March 17, 2013: Vanished Schools and Vanished Times: Wellesley Public School. Readers have submitted comments. The school bell is displayed at Church Street School, where students and staff transferred after Wellesley’s 1956 closing. See photo at: Wellesley Public School: The old school bell remains. 1877: Lord Dufferin, travelling by sleigh, visited the school, escorted by Doctor Ogden, Chairman of the board. 1956: School closed. Students transferred to Church Street School. By 1967, the Sutton Place Hotel was built on the site of the demolished Wellesley Street School. WEL-PS-a: (WWII): Illuminated list designed by A.J. Casson. “For King and Country / Members of / Wellesley School / who have volunteered for active service / with / Canada’s fighting forces.” Four columns. Surnames followed by given names and initials. No key. At the top of columns two and three is the heading “Killed.” List does not specify which war, but presence of women’s names, and the use of an A.J. Casson document, indicate World War II. This memorial is located at the TDSB archives, but no WWI memorial has yet been found. 1912: Land purchased for new school at Pape Avenue and Torrens Avenue (part of Maynard property). 1913: Two temporary portables erected at this site. 1914: Todmorden New School opened; 12 rooms. First fireproof school in Canada. Planned by Trustees George T. Davies, John McDonald and William Burgess. Architects: Lindsay, Brydon, and Greig. Construction by Holtby Brothers. 1915 May 27: Official opening. First principal: Hartman Jones. 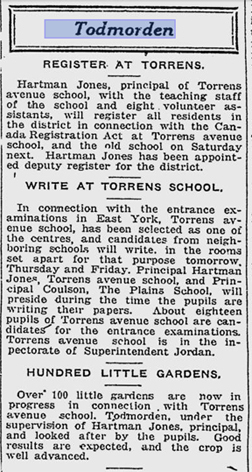 1915 Oct: Re-named Torrens Avenue School. 1919: Temporary 1913 buildings replaced by one twin portable. c1920: World War I cannon located at front of school. Removed after 1940. 1922 Apr 28: Official opening of west wing, at 7:30 p.m. “sharp.” Name changed to William Burgess School. William Burgess later achieved a record of 40 continuous years as a trustee (1898–1938). 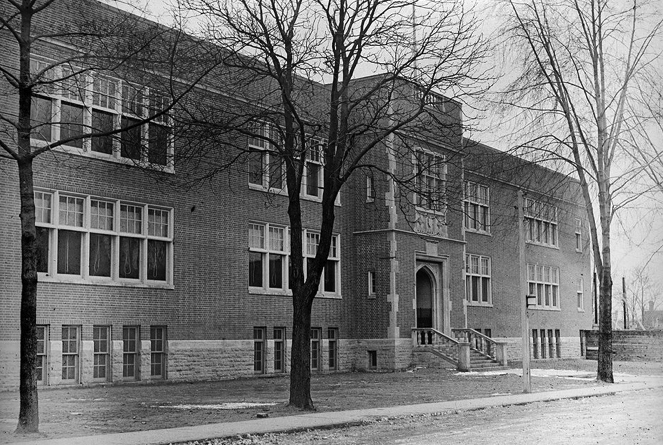 1920s: Two-storey addition with six classrooms and an assembly area in the basement added. Built by J. A. Wickett. Memorial tablet presented to school was unveiled in memory of “the boys” of S.S. No. 27 “who fell” in World War I. 1928: East wing opened; six rooms and a basement. School now had 24 classrooms. 1937: School closed for a month; poliomyelitis epidemic. 1935: Home and School established. 1937: Portables from 1920s dismantled. Two new portables erected. 1940 May: 80th Veterans Guard Cadet Corps (World War I veterans aged 45-65 years) conducted training at the school. 1941: Enrolment of 1,023 pupils. Largest on record. 1943: Secretaries hired by Board. Salary: $13.00 per week. 1944: Western Branch of Boys and Girls Library opened in school. Joint venture of the Kiwanis Club and Board of Education. 1948 Spring: After several name changes (including #1951 East York Kiwanis Club Cadet Corps), the cadet corps, now the Toronto Scottish Regiment Cadet Corps, moved from the school to Fort York Armoury. 1950s: School rented classroom space at Don Mills United Church. 1955: Grades 5 to 8 moved to Westwood Junior High. 1964: Addition of gymnasium with stage; two washrooms; dressing rooms. 1967: Library and two kindergartens added at north end. 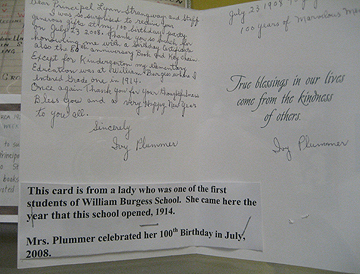 2008 July: (Mrs.) Ivy Plummer thanked the school, with a handwritten note, for acknowledging her 100th birthday. She had started school in 1914, the first year of the school and the first year of World War I. East York; Century of Education, 1856 – 1963. East York, Ont. : 1963. 6 leaves. William Burgess: our school – your school, then and now, 1914 – 1994. By Robert W. Ogden. East York, Ont. : 1994. 112 p.
WMB-PS-a: (WWI) bronze tablet; sculpted figure of “Britannia” centre of peaked top; below is a sculpted figure of a beaver. “This tablet is erected by/the people of Todmorden / in memory/ of the men of the community/ who made/ the supreme sacrifice during the Great War.” Top left: “1914” within a maple leaf circle. Top right: “1918” within a maple leaf circle. Below this is a scroll with “TODMORDEN”. Three columns. First names followed by surnames. Underneath the names: “Their name liveth for evermore”. Below that is a sculpted battle scene. 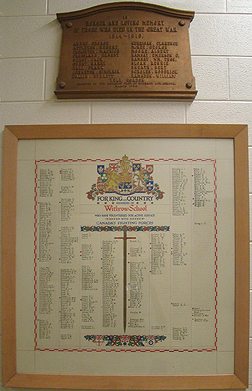 NOTE: Memorial tablet given to Royal Canadian Legion, Todmorden Branch 10, in the 1950s; returned to the school in 1994. WMB-PS-b: (WWII): A.J. Casson “For King and Country / Members of / William Burgess School / who have volunteered for active service / with / Canada’s fighting forces.” Eight columns. Surnames followed by given names. Staff names bottom right (indicated by penned brackets outside border). Key: Red cross indicates “Killed in Action”; red asterisk indicates “Missing”; red circle indicates “Prisoner of War.” List does not specify which war, but date of school opening, presence of World War I memorial, women’s names, and the use of an A.J. Casson document, indicate World War II. WMB-PS-c: (WWII) bronze plaque. “In honoured memory of the / boys of William Burgess School / who made the supreme sacrifice”. Top: left “1939”; centre, crossed flags; right “1945”. Three columns. Two names at bottom spaced evenly between rows. First names followed by surnames. At the bottom: “Their name liveth for evermore.” Below that is a sculpted battle scene. 1914 Sept: School opened with 453 pupils. Noted students include Doris McCarthy (entered 1915) and Glenn Gould. WMS-PS-a: (WWII) (illuminated list designed by A.J. Casson). “For King and Country / Members of / Williamson Road School / who have volunteered for active service / with Canada’s fighting forces.” Six columns. Surnames followed by given names or initials. Key: a file label stuck onto the glass, with a red stick-on dot before the typed words “Killed in War.” The red dots beside names are also stuck onto the glass, not on the list itself. List does not specify which war, but women’s names and the use of an A.J. Casson document indicate World War II. 1873 Dec. 20: Named for Winchester, Hampshire, England. Original land (280 x 165 feet) purchased from A.V. DeLaporte. 1874 Sept. 21: Frame, roughcast building opened at the corner of Winchester and Ontario Streets. Headmaster Andrew Hendry and Margaret Fraser taught all 207 pupils. Subjects were: Reading, Spelling, Arithmetic, Writing, Geography, Map Work, Drawing, Music, Grammar and Composition. The learning system consisted of “divisions”, not the grade system introduced in 1937 and still used in today’s schools. 1875: Two more teachers brought the staff’s total to four. Wood-burning stoves were used for heat. 1878: Enlarged to eight rooms. 1897 or 1898: Present building (nine-rooms, two-storey brick) constructed during Thomas Parker’s 25-year term as principal. 1901-1902: Enlarged to three storeys. 1903: Winchester was one of the first two in the city to offer domestic science training. 1917 May 26: In the Toronto Star Weekly, W.A. Craick praised Winchester’s unusually broad, well-lighted hallways and exceptionally high ceilings. 1931: Remodeling included fire-proof doors and a dual steel-concrete staircase for the 15-room building. 1958 Nov. 20: Twenty properties acquired ($379,000 approx. ), homes demolished for a new senior school. 1959 Sept.: students occupied the building. 1960 Oct. 27: Senior school formally opened. 1973 Aug.: Fire gutted the top floor of the “old” building ($400,000 damage). 1974 Oct.: Four days of celebration for 100th anniversary. Published history: History of the Winchester Street School, Toronto, 1874-1950. Toronto: Winchester Street School, 1950. WIN-PS-a: (WWI) Bronze plaque: “The right is more” [maple leaf] “precious than peace” / 1914 1919 / In grateful tribute to all from this school / who served in the Great War / and in memory of these who gave their lives.” At the bottom: “Greater love hath no man than this.” Two columns. First name listed is centred at top. Last name listed is centred at bottom. Surnames followed by first names. NOTE: The plaque honours all who served; the names appear to be of those who died. 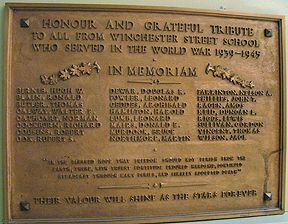 WIN-PS-b: (WWII) Bronze plaque: “Honour and grateful tribute / to all from Winchester Street School / who served in the World War 1939 – 1945” / [garland of maple leaves] “In Memoriam” [garland of maple leaves]. At the bottom: “In the blessed hope that freedom should not perish from the / earth, these, with truest fortitude endured hardship, continued / steadfast through many perils, and finally accepted death.” / “Their valour will shine as the stars forever.” Three columns. Surnames followed by first names. 1900 June 7: Board choose Withrow Avenue site for a new school in Riverdale. Avenue and school named for John J. Withrow, former alderman and founder of the Canadian National Exhibition. School designed by Charles Hartnoll Bishop. 1901 Sept: Four-room school opened with 146 pupils. 1906 – 1931: Four additions—at the time of replacement, the old school consisted of 21 classrooms, two kindergartens, exercise rooms, library, staff rooms, offices and a health room. 1916: Toronto Home and School Council organized; Withrow was represented. 1968 Oct 31: Board decided to replace old school. 1971 Aug 5: Construction started. 1972 May 24: Cornerstone laid by trustee Graham F. Scott. 1972 June 26: New building occupied by students. 1988: Toronto Historical Board erected a plaque describing the Bain Avenue school grounds’ origins as an aboriginal encampment, dating back 4,000 years. The sandy knoll provided an excellent lookout over the Don River Valley. The site, lost for many years, was uncovered by road workers in 1886. David Boyle, Ontario’s first professional archaeologist, excavated the site—one of the few in the city for which archaeological evidence exists. A small number of artifacts survive from the now destroyed encampments; some are displayed in the school. 2003: Celebration of 100th Anniversary. WIT-PS-a: (WWI) Bronze plaque: In / Honour and Loving Memory / of those who died in the Great War /1914 – 1919. Two columns with last name at the bottom, in the middle of the columns. Surname followed by given names (19 names listed). At the bottom: Erected by the Mothers’ Club of Withrow Ave. School, / March 1920. WIT-PS-b: (WWII) A.J. Casson “For King and Country / Members of / Withrow School / who have volunteered for active service / with / Canada’s fighting forces.” Eight columns. Surnames followed by initial(s) except for women whose given names are in full. Key: A red hand-drawn cross, indicates “Killed”; an orange hand-drawn circle indicates “Missing; Presumed Dead”; a yellow hand-drawn star indicates “Decorated”; a blue hand-drawn star indicates “Prisoner of War”; a red hand-drawn square indicates “Teachers on Withrow Staff.” List does not specify which war, but presence of World War I memorial, women’s names, and the use of an A.J. Casson document, indicate World War II.